Few recent advances in science have generated as much excitement and controversy as human embryonic stem cells. The potential of these cells to replace diseased or damaged cells in virtually every tissue of the body heralds the advent of an extraordinary new field of medicine. Controversy arises, however, because current techniques required to harvest stem cells involve the destruction of the human blastocyst. 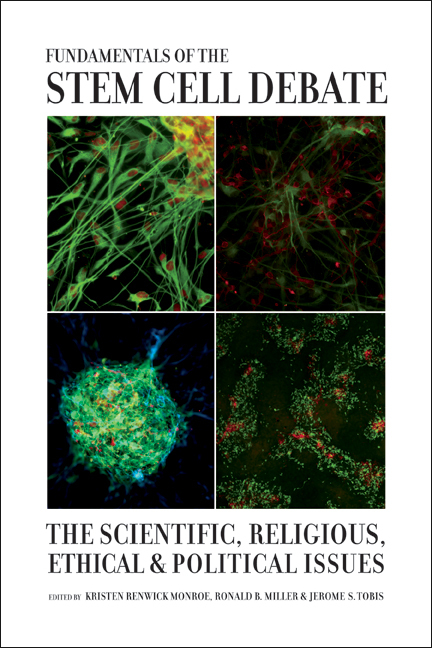 This even-handed, lucidly written volume is an essential tool for understanding the complex issues—scientific, religious, ethical, and political—that currently fuel public debate about stem cell research. One of the few books to provide a comprehensive overview for a wide audience, the volume brings together leading scientists, ethicists, political scientists, and doctors to explain this new scientific development and explore its ramifications. Kristen Renwick Monroe heads the University of California at Irvine Interdisciplinary Center for the Scientific Study of Ethics and Morality and is author of The Hand of Compassion: Portraits of Moral Choice during the Holocaust and The Heart of Altruism: Perceptions of a Common Humanity. Ronald B. Miller is Clinical Professor of Medicine Emeritus at the University of California, Irvine, and a member of the UCI Stem Cell Research Center Advisory Committee. Jerome Tobis is Research Professor and Chairman Emeritus of the Department of Physical Medicine and Rehabilitation at the University of California, Irvine.